Xenophon’s Anabasis provides the model for this epic first novel of Greek mercenaries stranded in the heart of the Persian empire during the late fifth century b.c. When Xenophon composed the Anabasis he used the pseudonym Themistogenes of Syracuse, but here, Ford brings Themistogenes—Theo—to the foreground as narrator and protagonist. Xenophon’s lifelong companion, Theo is initially a slave, later a freedman, and now serving as aide-de-camp. It’s through Theo’s eyes that we see Xenophon’s growth from a rather delicate and pampered boy to the questioning young scholar who sits at the feet of Socrates, to the soldier of fortune. The main action takes place after Athens’ defeat by Sparta and the subsequent reign of the Thirty Tyrants. Xenophon is lured to the mercenary life, against his father’s wishes, by a cousin, Proxenus, who is in the command of Cyrus the Younger, half-brother to the Persian king Artaxerses and pretender to the Persian throne. When Cyrus is killed in battle, the entire Greek command, ten thousand strong, is left to fend for itself in hostile territory. Later, when the Greek commanders, including Proxenus, are treacherously murdered by the Persians, Xenophon leads them through Asia Minor and Armenia to the Black Sea. Having Theo narrate is a nice touch, as he can move freely through the army’s strata. His observations and comments are sharp, the way we have come to expect a person of his rank to behave in literature. With the exception of Socrates, he spares no one, and is pointedly critical of Thucydides, historian of the Peloponnesian War. The descriptive language throughout is heroic, at times echoing the Iliad. Ford brings an interesting, fictively personal outlook to one of the classics. 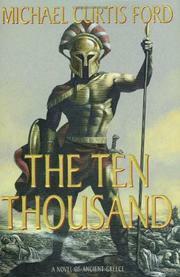 Inspired and highly informed, The Ten Thousand may lead many readers back to the original.